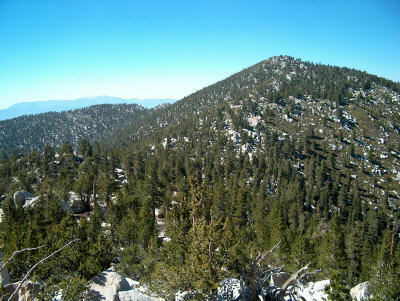 Jean Peak Via Fuller Ridge is a 15.9 mile out and back trail located near Idyllwild-Pine Cove, California and is rated as difficult. The trail is primarily used for hiking and horses and is best used from March until November. Horses are also able to use this trail. This trail is up and down, up and down. It is very hard to get a rhythm going as you are constantly changing pace. The trail is much easier going in, than coming back out and some of the final ups and downs can be very painful. Make sure you are in good shape for this one. There is no trail to Jean Peak, you must make your way boulder hopping and bushwhacking through Scrub Oak. It is pretty easy going though, and getting to the top is simple. Finding your way back is also easy, just head for the highest point. 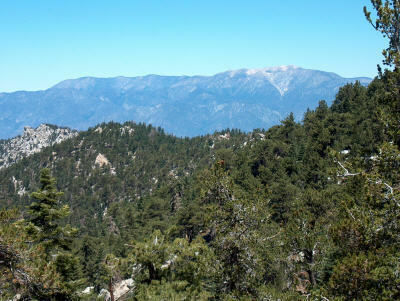 Take the 243 from either Banning or Idyllwild, drive until you reach Black Mountain road. Turn East onto the dirt road. It is rutted and rough, but you should be able to make it with even a low-clearance vehicle. Follow the road for 8 miles to the turnoff for the Fuller Ridge trail road (signed.) Drive to the parking area and the posts for the PCT are east to pick up. Give yourself a good hour and fifteen minutes drive time from Banning, although the trail is perfect for a late morning stroll. It doesn't get very hot, even in August. Take the PCT to the connection with the Deer Springs Trail, turn almost 180' and go up the mountain. 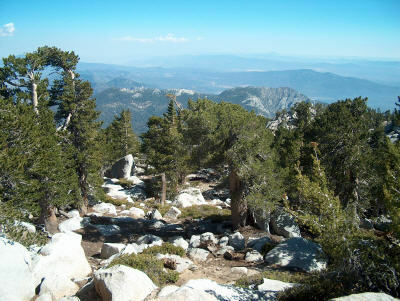 At the connection with the short San Jacinto Summit trail, turn right and bushwhack your way 1/2 mile to Jean Peak. There is a summit register under some rocks at the top.